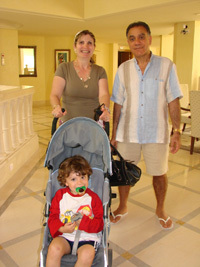 The Boukhris family of Paris, Enoun, Missa and baby Eli, return each year to Djerba for Lag B'Omer. Bonnie Squires recently traveled to the Tunisian Republic to visit the Jewish community there. Tunisia, as it is commonly called, is a small country in northern Africa situated between Algeria to the west and Libya on the southeast. Tunisia’s northern border is the Mediterranean Sea. The Tunisian Republic won its independence from France in 1956. The Jews of Tunisia have a history 2000 years long. Jews have been in Tunisia since the time of the Phoenicians. In modern times, Tunisia is the most western of all the Muslim countries, an oasis with only 10 million people, the smallest country of the Maghreb (northern region of Africa). It is at the northernmost tip of the African continent and lies due south from Rome. Tunisia has the best preserved Roman ruins and aquaducts in the entire world. 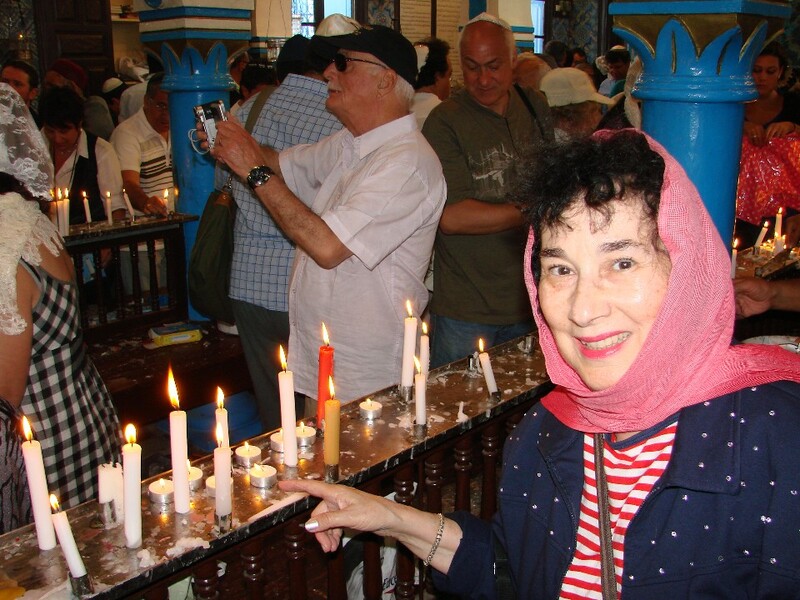 Bonnie Squires lights a candle inside El Ghriba synagogue in Tunisia. Today’s Jewish population, about 3,000, lives comfortably among their Arab neighbors. 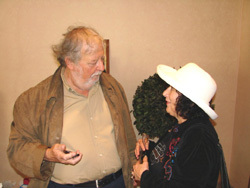 There is a Jewish member of the Parliament, Senator J. Roger Bismuth, and the larger of the two fig liqueur companies in the country is owned by an old Jewish family, the Bokobsas. The Tunisian government protects the synagogues, particularly the El Ghriba in Djerba. There are two major centers of Tunisian Jewish life: one in the capital city of Tunis, and one in the southern island of Djerba. The Tunis-area Jews, approximately 1000 of them, often travel back and forth several times a year between homes in Paris and homes in Tunis, Gammarth, Carthage and La Goulette. 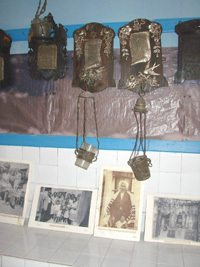 There are several synagogues in Tunis where Jews gather for Shabbat and to celebrate Jewish holidays. The Djerban The Djerban Jews, who have as their magnet the ancient synagogue El Ghriba, are more stationery, although there are only about 2000 Jews left on the island. Djerban Jews who have migrated to France and Israel, however, still love to make the traditional pilgrimage home for a week or two around the festival of Lag B'Omer. Up to 5000 "pilgrims" arrive each year for the holiday. I was fortunate enough to be among the celebrants this year. 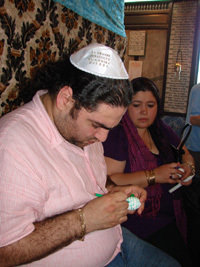 Painting prayers and wishes on eggs is an age-old tradition at El Ghriba. 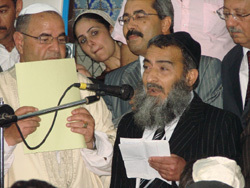 The Grand Rabbi of Tunisia speaks at a formal program in El Ghriba Synagogue, with the president of the syngague, Perez Trabelsi, standing next to him. 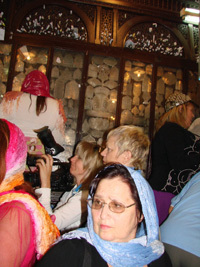 Journalists come from around the world to witness the Lag B'Omer pilgrimage in Djerba, Tunisia. The two blonde women in the background are video documentary maker Sonja Stark and freelance writer and filmmaker Judith Fein. 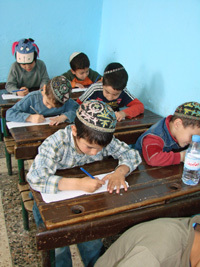 At the Yeshiva in Djerba, Tunisia, boys wear a variety of head-coverings. contains memorials to Jews who once lived there. Fabien Bokobsa, a Jew from Tunis, is interviewed by Bonnie Squires about his family's three generations of producing Bouka, the famous fig liqueur. 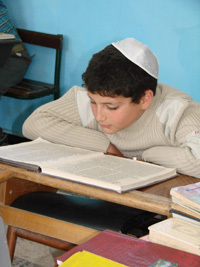 At the Djerba Yeshiva, a young boy studies Torah. 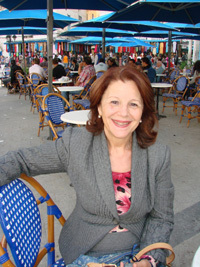 Evelyne Saada, whose husband Roland serves as honorary Hazzan of the synagogue in La Goulette, near Tunis. 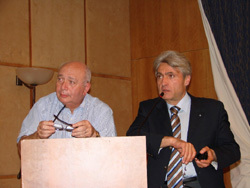 Professor Nafta (left) and Dr. Kabla take questions (in French) on the history of Jews in Tunisia.